No matter what you hear from today’s so called SEO experts, the bottom line to content marketing and SEO is to optimize, optimize, optimize. This isn’t like your fathers SEO, no, it’s is a whole new ball of wax that calls for extra specialization and internet acumen. Today’s content marketer has his or her hands full. No more stuffing a websites full of keywords, keyphrases, and keywords and hoping for the best. The old link building won’t help either. The trick to SEO and content marketing is just good old plain marketing. Why? Because marketing the traditional way is a solid foundation and easy to follow message. You’ve got to be careful here. Just because you can doesn’t mean you should. What’s happening for the better is that nowadays it takes skill, creativity, the kind of attributes that others don’t have. 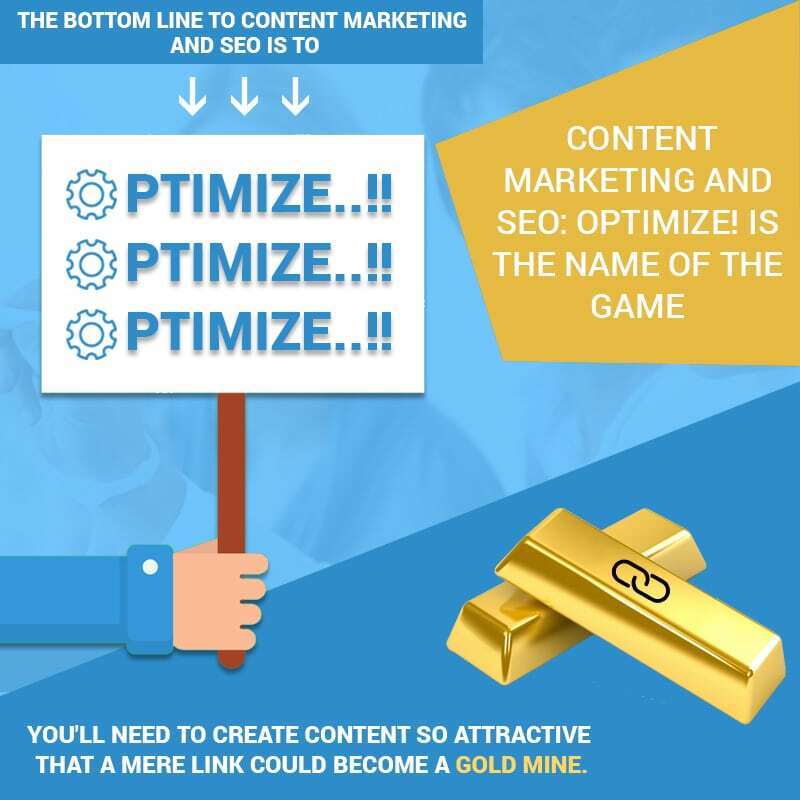 Sharing content via inbound links means you’ll need to create content so attractive that a mere link could become a gold mine. Authority sites come in here big time. You’ve got to be the ‘go to’ site for the latest and important information regarding your trade. You’ll need to understand social media as well. People have to be chatting about your site, mentioning your site. Those posts, likes, shares, links, carry a lot of weight especially when they’re frequent and diverse. When you’ve got the public not only going for your web site but coming to it via a variety of sources then you’re getting that kind of organic traffic that is organic and targeted. There is no better traffic. This is what is meant by needing skills. Not some script generating robot that seeks out info and applies it. You have to do keyword research, however and integrate it into your content. Do not make the mistake of just grabbing keywords and using them when they have nothing to do with your website. A website about plumbing shouldn’t be awash with keywords associated with television sets. Just using common sense is enough here and creating relevant, important, and creative content is the best foot forward. Look for those keywords relevant to you industry, then honestly write about them. Use both personal and professional stories like, “The time we had a client who wanted full plumbing replacement but wouldn’t move out of the house.” or “Dealing with people who just won’t cooperate with the plumbing process, especially when it calls for them to move out of the house for few days.”. These stories are not only going to contain your keywords, keyphrases, and keygroups, but when you talk about these incidents on social media, other people will read them and associate with the stories and comment on them. The pros will share the content because you’ve expressed something about them that they couldn’t express themselves. People, both public and private appreciate such stories so that your content marketing becomes addictive to them. Your content can become a serial to others who depend on your insight to lower costs, better service, and more. This is the heart of the new SEO field. Quality content and optimizing such content so that nothing is missed. Here is where the technical end comes in and you had better be up on it. Know how to build a website and blog. Know, not guess, where to place pics and videos and tag them correctly. This way you have such a solid foundation on which to build upon that any content marketing you do will rest tidy and snug on a rock, not a mud field. No, today’s SEO and content marketing isn’t easy. It’s due primarily to Google and other search engines battling against scammers and for good reason it now places the winning flag on content, not strategy.